Based on research in the Inquisitorial archives of Northern Italy, The Night Battles recounts the story of a peasant fertility cult centered on the benandanti, literally, “good walkers.” These men and women described fighting extraordinary ritual battles against witches and wizards in order to protect their harvests. While their bodies slept, the souls of the benandanti were able to fly into the night sky to engage in epic spiritual combat for the good of the village. Carlo Ginzburg looks at how the Inquisition’s officers interpreted these tales to support their world view that the peasants were in fact practicing sorcery. The result of this cultural clash, which lasted for more than a century, was the slow metamorphosis of the benandanti into the Inquisition’s mortal enemies―witches. 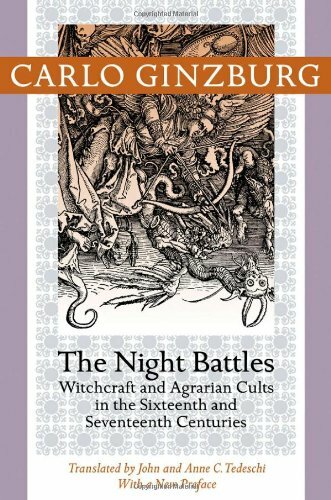 Relying upon this exceptionally well-documented case study, Ginzburg argues that a similar transformation of attitudes―perceiving folk beliefs as diabolical witchcraft―took place all over Europe and spread to the New World. In his new preface, Ginzburg reflects on the interplay of chance and discovery, as well as on the relationship between anomalous cases and historical generalizations.